A shocking video featuring a child seemingly praying to the commander-in-chief is sparking outrage from conservatives, as well as more religious members of the public who view the boy’s actions as possibly blasphemous. “Barack Obama, thank you for doing everything and all the kind stuff… Thank you for all the stuff you helped us with,” the little boy, who identifies himself as Steven, says as he kneels down and closes his eyes in typical praying fashion. “You are good, Barack Obama. You are great and when you get older you will be able to do great things. Love, Steven,” the boy concludes. In the past, we have documented how Obama’s image in the mind of children has been elevated to a “messianic” cult-like status, promulgated through indoctrination facilities better known as public schools. 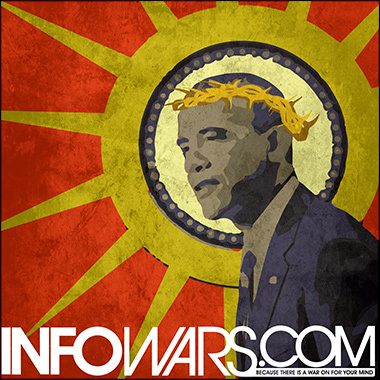 We’ve also documented Obama’s manufactured ascendance to a cult of personality figure, and the dangerous slippery slope America begins down when it starts lifting presidents up as idols. “The Orwellian nature of what is going on in American schools should at least send a shiver down the spine of all those who are aware of what has happened historically when leaders carefully groom a cult of personality and create a generation of mindless sycophantic followers who are unaware they are pledging allegiance to a dictator,” Prison Planet editor Paul Watson wrote in September 2009. The controversial prayer video is just the latest example of the type of feverish leader worship historically only witnessed in communist and totalitarian regimes, such as North Korea, Mao’s China and Nazi Germany. Watch the videos below to see how public schools have encouraged the wholesale idol worship of Obama. In this video, a school teacher [out of frame] encourages children to praise Obama with a song. The next video features Illinois schoolchildren creepily chanting, “Yes we can,” followed by an accurate comparison to the Hitler Youth brigades. Many may recognize the next video from 2008, in which a Missouri schoolteacher was found to be organizing some sort of student militant Obama youth group. Together they choreographed a routine where each student announced that “because of Obama” they could achieve certain things in life. They then sound off on Obama’s economic and healthcare policies. This last video we found particularly disturbing as it features teenagers from a school in – of all places – Toronto, Canada, rendering a painful remix version of our beloved leader’s inauguration speech in his honor.